Seymour Cray, Lester Davis, and Maurice Rousch, design grants, US D233758 S and D234022 S, 1974. [Maurice] HUTSON: What determined how many boards you stacked to make a module? [Dennis] GRINNA: I think the 16 bit orientation. 64 bits per word, broken down into 4 modules, that dictates 16 bits per module and we needed 2 control boards so we had 16+2 [=] 18. 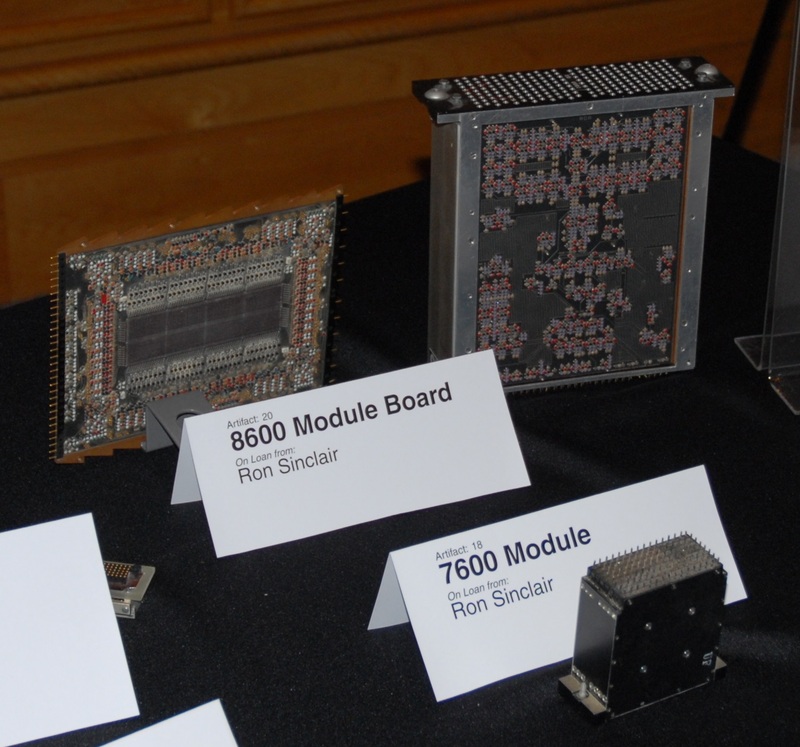 ... One module for comparison was equivalent to 27 - 7600 modules. See also the coverage of the 8600 in Charles J. Murray, The Supermen: The Story of Seymour Cray and the Technical Wizards Behind the Supercomputer, Wiley, 1997, in which Murray decribes the use of large modules of discrete transistors as a "reliability nightmare". When I was in Chippewa recently, I visited the Cray Corporate Computer Mueseum (open to the public and a great place, you should stop by if you happen to be in the northern Wisconsin woods). They have on display a 1604, 6400, 6500, 7600, and Cray-1 serial 1. Anyway, they also have a small exhibit on the CDC 8600. Unlike the other exhibits which had real hardware, it was only a photograph. The photograph was extraordinary, however. This machine (which was only a prototype) was a small squat cylinder about 3 feet high with a larger and even squatter cylinder of power supplies underneath it. At first I mistook it for a Cray-3. Design started: 1970 (project abandoned in 1974). It would be a respectable machine even today. It has been widely believed that the cancellation of the 8600 was the impetus for Seymour to leave CDC and found Cray Research. I'm skeptical though because the exhibit said the project was cancelled in 1974, but Seymour founded CRI in 1972? Since I have a bit of historical data I thought I would pass on some (rather old) information on the 8600. Maybe someone will find this useful for the archives. I have an assembler listing of an 8600 simulator (dated 71/03/07). The instruction set was to be 16 or 32 bit instructions with 8 bit opcodes, 4 bits per register number and therefore 16 X registers. Apparently, A and B registers were not in the design. Other details of the architecture are not clear (i.e. were there any PPU's). 3D JP+ Xj+k Jump to (Xj)+k and set prf? The machine was a 4 CPU 8 ns cycle time machine. It had 256K words of core memory. Still 1's complement. There were no A and B registers, only 16 X-registers. Memory cycle time was 250 ns, but could transfer a word every 8 ns, 64 banks. It used either a 6000 or 7000 pp subsystem to connect to 16 8 or 12 bit I/O channels. The CPU had instructions to read/write the I/O channels. There was an interupt mechanism for channel I/O. From the instruction descriptions, it looked like branching was relative (i.e., P+K). The machine was not larger than 3' in any direction, 14 sided circle looking much like a flying saucer. Imagine a full circle Cray 2 on a power supply platform. *** sst - Shell sort table. * D. A. Cahlander. 71//04/30. * SST sorts a table using a Shell sorting technique. * The table is sorting in place into ascending order. * a$ll elements should be of the same sign. * First coded by /R. Hotchkiss in *sort1*. * Revised by /L. A. Liddiard. * Revised by /E. J. Mundstock. * Revised by /G. R. Mansfield. * Entry xa = Address of table to be sorted. * x1 = Number of elements in array. * Saves x - 0, 5, c, d.
* It was designed by Seymour Cray (no kidding :-)). * The 8600 had a 20-bit address space. * Modules had discrete transistors, 18 boards/module, 4 layer boards. 13 modules/CPU. * Approximately 2.5 x 7600 speed/CPU. Total speed about 10 x 7600 speed. * Two memorys were designed. Core memory with about 20 nsec access time. Semiconductor memory with about 22 nsec access time. 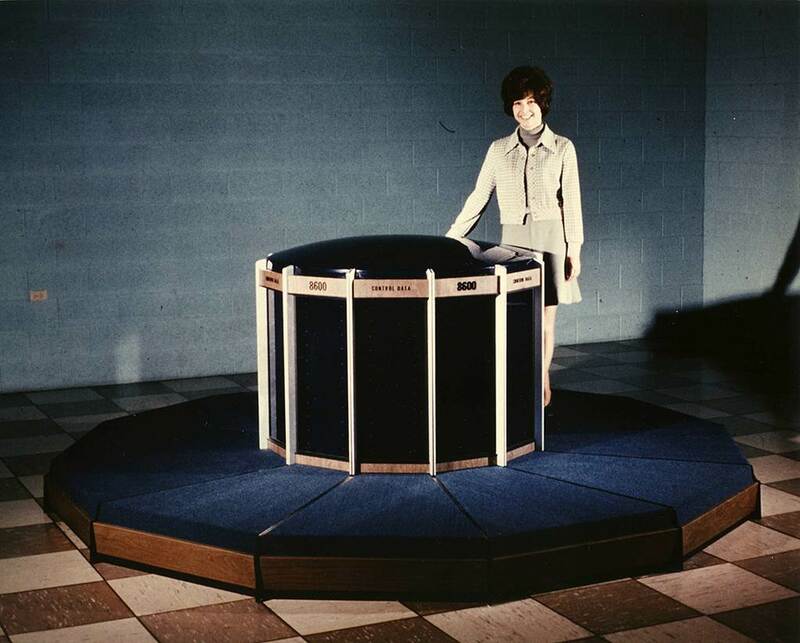 As long as we're discussing obscure architectural features of the old CDC machines, I thought all the old CDC'ers out there would enjoy hearing about some genuinely weird CDC equipment that I once worked with. From late 1971 to early 1973, I worked for CDC in Minneapolis as part of the "Software Research Laboratory" (SRL). This was a group of about 50 people working on a totally different operating system. I have found very few CDC folks who have ever heard of SRL. We were sometimes known as "Tom Parkins" group. Parkins was a CDC VP who came from Aerospace Corporation around 1970. * A 30 PP 6600, with each bank of 10 PP's having its own deadstart panel, and a separate set of 12 channels. This machine was actually the Minneapolis Cybernet host. While it was running production workload for paying customers, we would run a job which would locked into contol point 1. The 2nd & 3rd PP banks could then be deadstarted, reading their boot programs from the FL of the job at CP 1. The experimental OS we were testing had its own set of peripherals attached to the 2nd & 3rd PP banks. The SCOPE OS running in the 1st PP bank didn't know anything about the experimental OS. * "Seymour's phoneboth": a station consisting of 3 7000 chassis - 9 PPU's & a 65K bank of LCM. The chassis were arranged in a U shape, making it kind of a mini-7600. The PPU's could access both the LCM bank, and an ECS bank over a "7000 channel DDP". * A 3300 connected to an ECS bank via a "3000 channel DDP". 1. User/monitor mode. In user mode, no I/O instructions could be issued, and part of memory could not be accessed. 2. A boundry register to divide the memory into user and protected areas. Addresses below the boundry could be used in monitor or user mode, but addresses above it could only be used in monitor mode. 3. Alternate direct cells. In monitor mode, all direct cell references were to addresses 77xx, rather than 00xx. I'm not sure, but I think the only way to reference the normal direct cells in monitor mode was via xxI or xxM instructions. 4. Interrupts. Any interrupt condition while in user mode caused a RJM to the address in the boundry register. The monitor code then examined a status register to see if the interrupt was due to an illegal operation by the user mode program, an external event, or an explicit RJM done by the user to invoke a system function. I may be the only person to have written an interrupt handler for a 6000/7000 PP. Nothing ever came of the hardware and software we were working on. At one point, there was an idea to create a "Cyber 30" product which would consist of a 3300 and a 7000 PPU station connected to a common ECS bank. The idea was to "extend the life of the 3000 line by giving it PP's." SRL was disbanded shortly after I left it in early 1973. For those who care, SRL was originally located in rented space in "Pentagon Park", near the Normandale facility at I494 & highway 100. In late 1972, we were moved to the "super cluster" facility in Mod C.
The Cray-1 had two circuit boards mounted back to back on a copper cooling plate to form a module, but the two boards were connected only by backplane wiring. Hockney and Jessope describe a special four-board module for the Cray-XMP that had Z-plane interconnections between the two innermost boards. 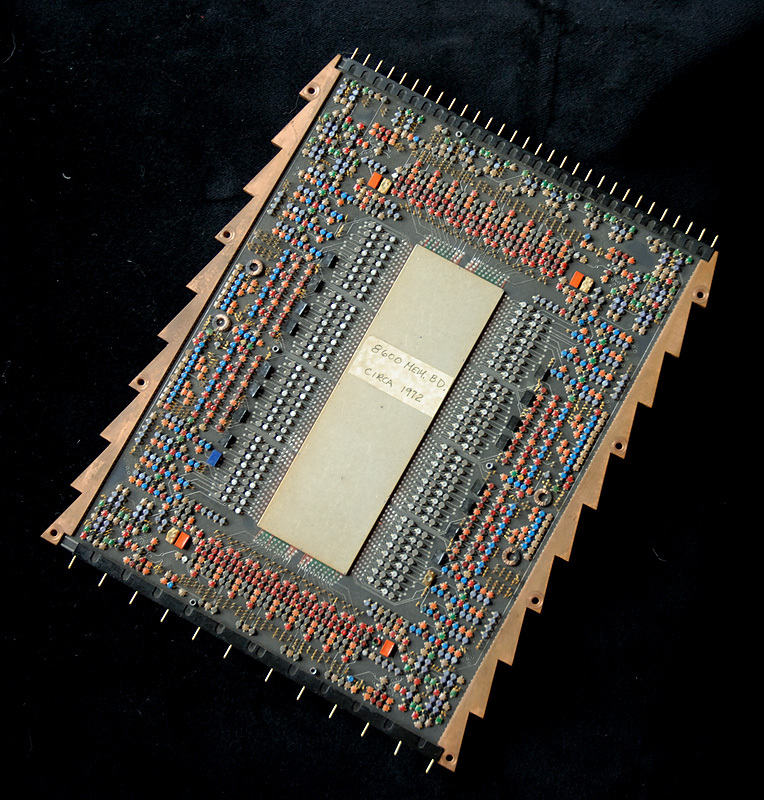 The Y-MP returned to the two-board modules but used a cooling plate with circulating Fluorinert rather than a solid copper plate. 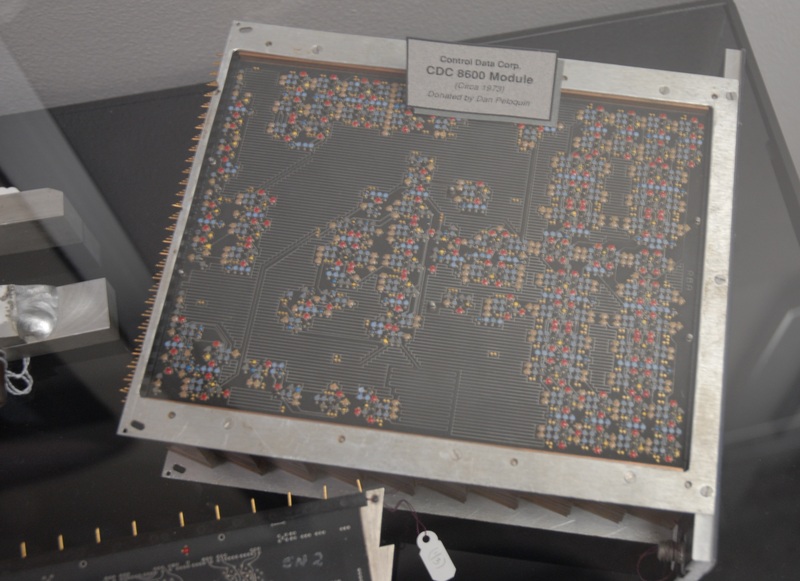 The Cray-3 provided thousands of Z-plane interconnections in a module. See the Cray-3 Hardware Description Manual, Gino Mancini's Cray-3 pages, and U.S. Patent 5,014,419. Acknowledgement: Photos are courtesy of Joe Cychosz. Also my thanks to Joe for his help with CDC and Cray hardware details.